Triangle/Ternary plots are a good way of displaying the relative positioning of points across three variables. This can be used to cluster and classify points based on these three variables. 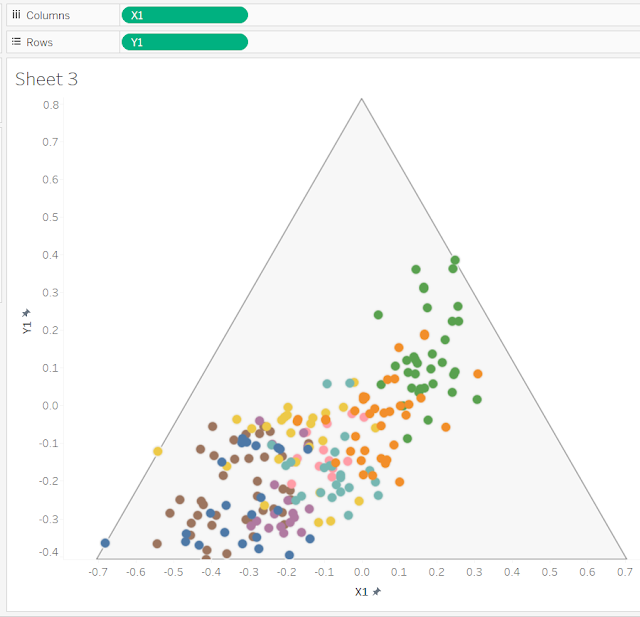 After the break I have outlined a way of creating an interactive version of a triangle/ternary plot in Tableau. 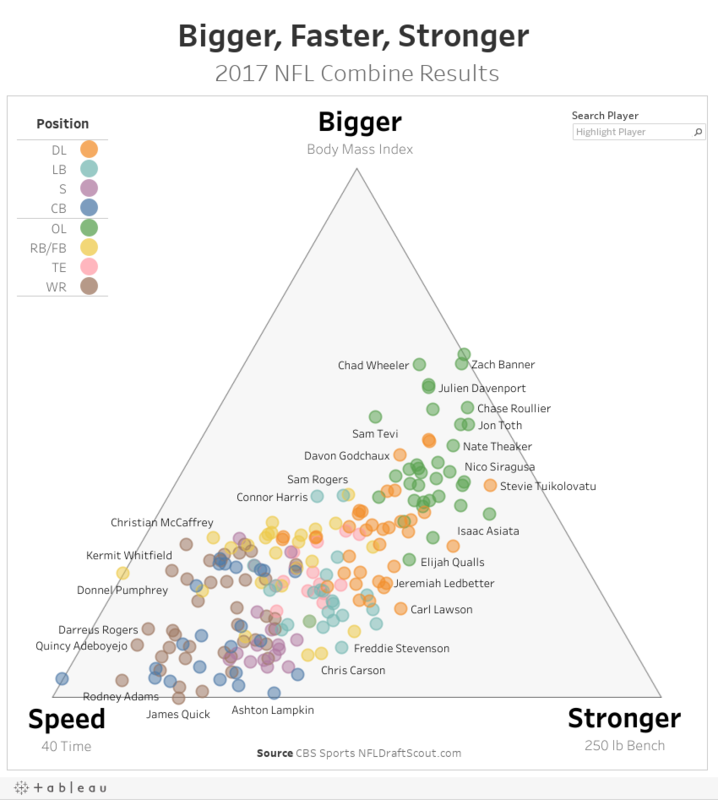 Here is an example of a triangle/ternary plot on the performance of collegiate players at the 2017 NFL combine across three variables: size (BMI), speed (40 time) and strength (bench press). 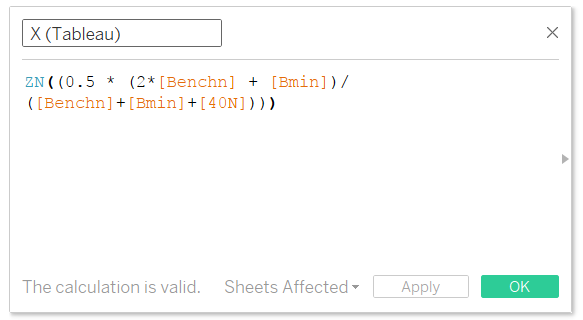 So I have a table of 3 normalized variables (40 time, BMI, and bench press) by player. I also add 3 anchor points to determine the corners of my triangle plot. So I have three extra rows where the value is 0 for each row except 1 for each variable. This will create X and Y coordinates associated with each point (player). I append this to my player data set and bring this into Tableau. 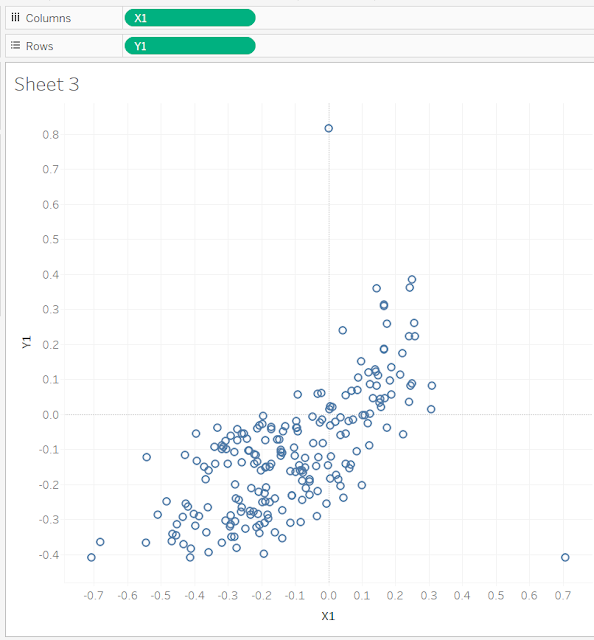 To create the triangle plot in Tableau I place the X coordinates in the column shelf and the Y coordinates in the row shelf and convert the measures to continuous dimensions. Finally, I add a triangle as a background image, fix the X and Y axes, and then remove anchor points (in the corners). I also do some formatting removing the gridlines, adding color, and increasing the transparency. The talented Mike Cisneros (@mikevizneros) recommended an approach that skipped the R step and allows you to create this entirely in Tableau. Here is link to Mke's version on Tableau Public. It only requires two simple calcs and is much more clever than mine. See details on these calculations here on Wikipedia. You again place the X and Y values into the column and row shelves respectively and repeat the other steps above. You can download my Tableau Public file above. It has both versions (R and Tableau) included. I hope this is helpful. If you have questions please leave them in the comments box below. Thank you. Thanks for the great info. The Tableau only way helped alot. Is there any reference to the explanation of the calculation? I'll like to understand more about the concept rather than just simple copy pasting the formula. Updated post to include this. Thanks for the comment. The article is very helpful and implements ternary plots beautifully. Can you please share the background image of the triangle that you have used and explain how you fix the X and Y axes, and then remove anchor points along with other formatting steps.